I am all about the most efficient way to accomplish, well, anything, but especially cooking. I can’t tell you the collection of quick, fast, 4-ingredient-or-less and one-pan skillet recipes I have amassed over the years! It’s actually impressive when I think about it. But that’s not the point, the point is that I am lazy efficient in the kitchen and if there is a faster way to do it, or if there is a step that can be eliminated, I’m the first to do it! Having said that, this recipe is a two-parter… and as you now know, that’s not my style, but there was something about the flavor combination that had me ready to spend a few extra minutes in the kitchen! 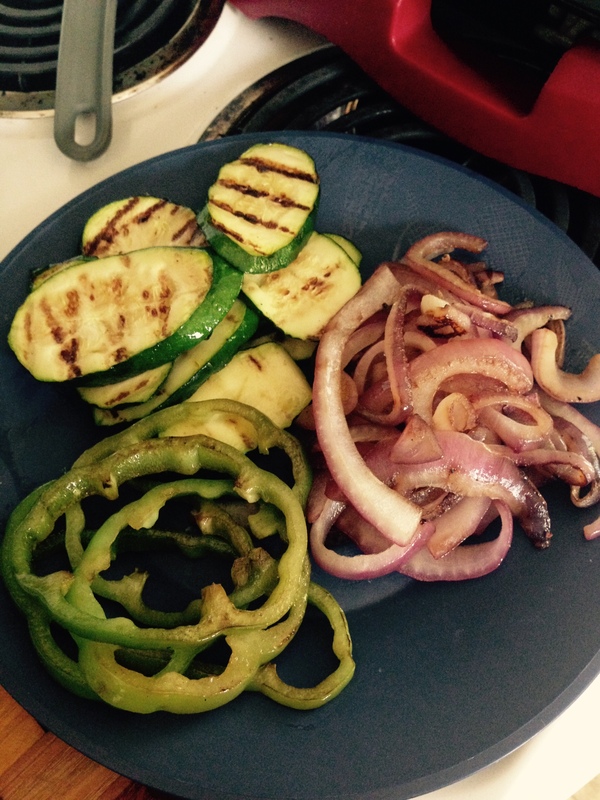 First, pick your vegetables, and honestly, I just grabbed what I had in the veggie drawer, a zucchini, bell pepper and onion, and then grill them. Now, a real Texan would have fired up her grill. But, it’s 100 dg. and I cheated (see above re: efficiency) and grabbed my indoor grill and got those suckers going. While those are cooking and filling the kitchen with wonderful smells, it’s time to create some pesto! Homemade pesto is so easy to make, grab your food processor or blender, and toss in a big handful of basil leaves, some pine nuts, some parmesean cheese a bit of garlic and olive oil to help mix it all together. That’s it! Now, you can also buy a jar at the store, I totally won’t judge you for that, and since you need some goat cheese and whole grain wraps, you’ll already be at the store anyway! Take your wrap and smear one side with the goat cheese and the other side with pesto, and then top with the grilled vegetables, fold in half and put back on the grill to warm up the pesto and cheese, and voila! 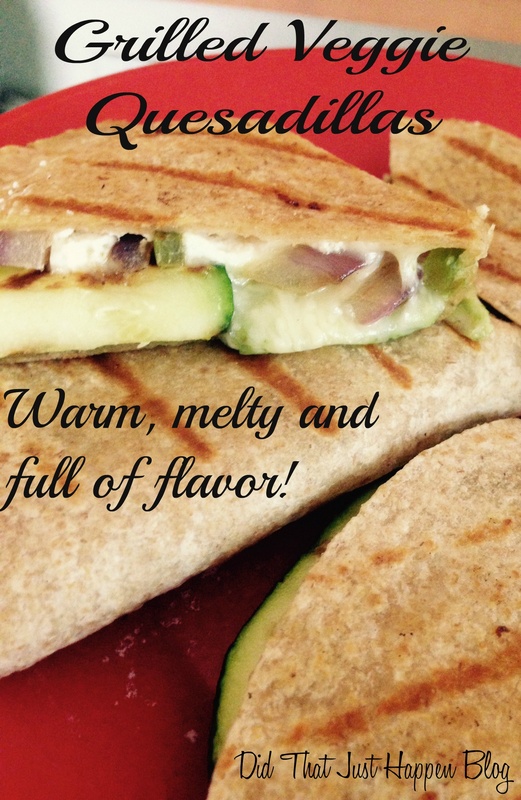 You now have some warm, melty, grilled vegetable quesadillas! And the extra time it took to grill the veggies really brings an extra layer of flavor to the dish, Mr. T didn’t complain once about the meal being vegetarian! I added a handful of grapes and blueberries to the side of the plate and dinner was done! Slice the vegetables and brush with oil (or spray with cooking spray, or use a non-stick grill pan) and grill. 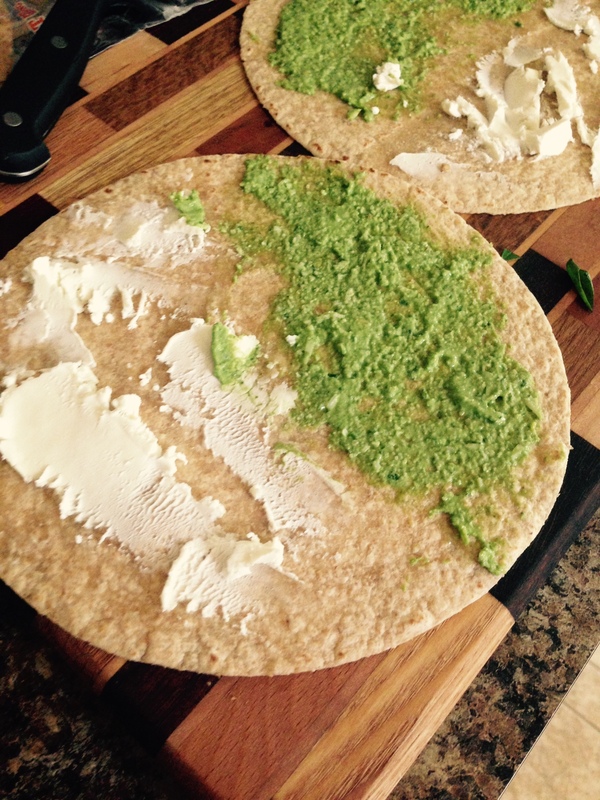 Take your tortilla and spread pesto on one half and goat cheese on the other. 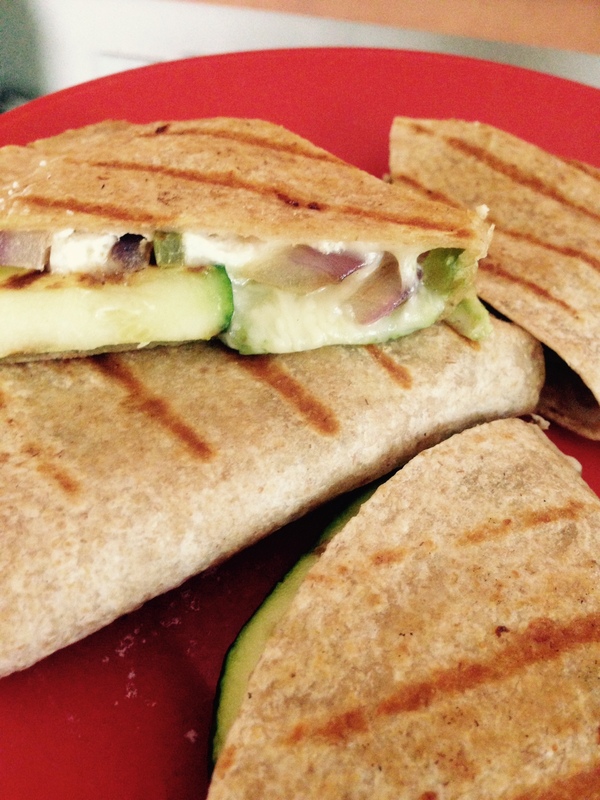 Place grilled vegetables on cheese side of tortilla, fold in half and place back on the grill. I bought a fanny pack. I even have to admit that I don’t regret the purchase! You know I’ve been on a journey to better health and recently I’ve started running. I can’t say I love it, but I can’t say I hate it either! It’s not easy, but I miss it on my rest days. I found an arm band and have been using that to hold my phone, and while it’s not my favorite, I was fine with it. Until I noticed that it is starting to rub against my workout shirts. So I started my search. And by that I mean, I sorted by lowest price on Amazon! I really wanted a Flip Belt, but they don’t come in my size. Nothing against Flip Belt, it’s just not easy at all to find fitness gear for a “plus” sized woman. It involves a lot of measuring and guessing and then a quick prayer that it will actually fit and work! I found a belt, it was nice and compact, and if my measurements were correct, it would span my waist. And, it would hold my iPhone. The belt looks good, right? Not obtrusive at all. But, I still can’t figure out what the model is storing in hers. I mean, if you are going to show a picture of the product being used, shouldn’t it actually be in use? I mean, would it be a shame to show products doing what they are supposed to, but whatevs! 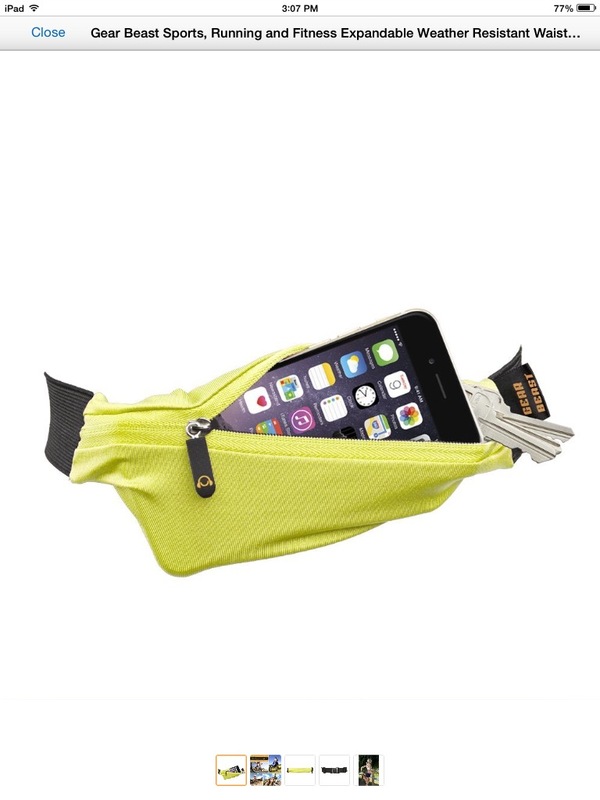 The picture shows that it holds the phone and keys… and it claims to be able to hold more – but my phone is all that really mattered, as my running shorts have a pocket for my keys, I just need to be able to have my headphones in while I’m pounding the pavement – and for the low price of $9.99, I clicked “order”. 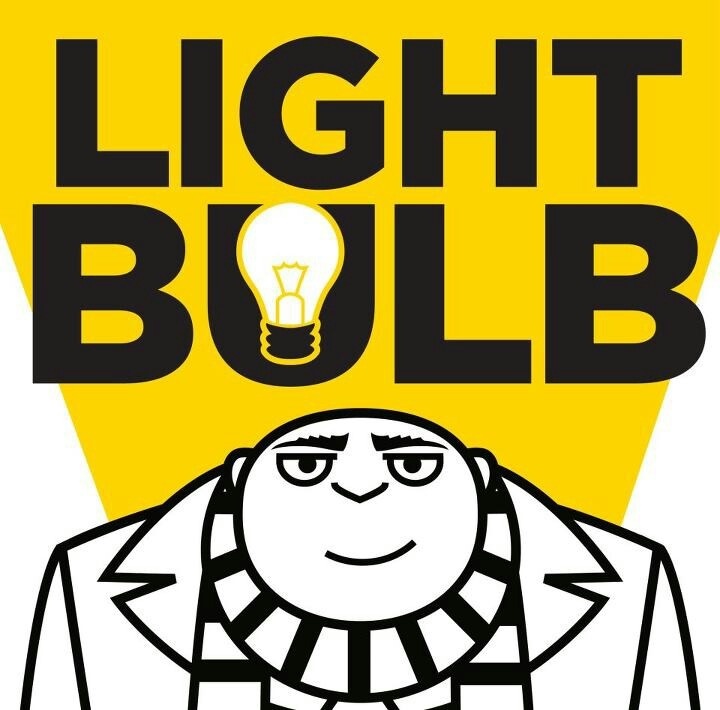 I’ve used it twice and pretty much love it. It is an elastic band attached to the yellow banana pack, but it is able to be tightened up as the elastic stretches… or as my waist shrinks! But every morning, when I’ve snapped this on, I’ve giggled, cause, really, it’s nothing more than an elastic fanny pack. The Rock. 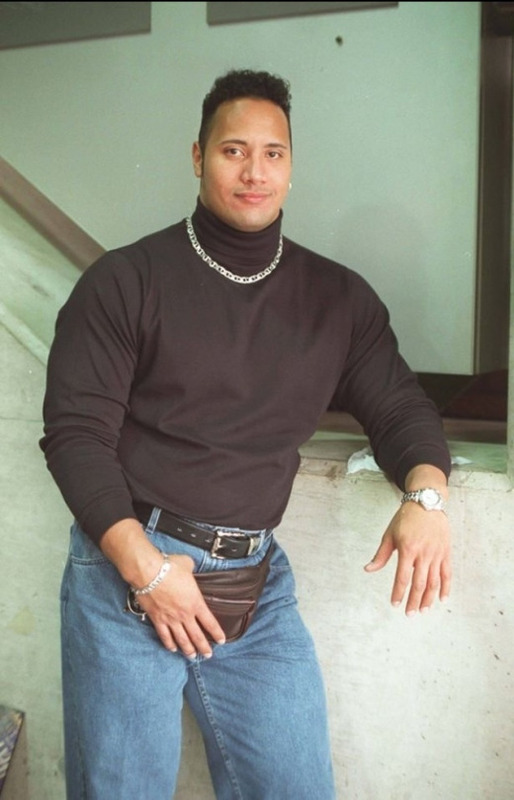 He is totally rocking the fanny pack. 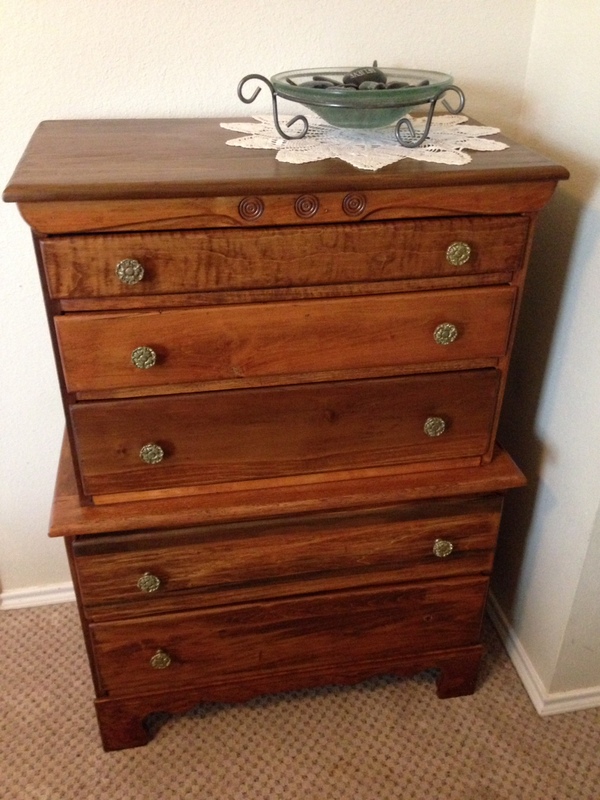 Way back in February I introduced you to my great grandparents highboy dresser that I wasn’t going to restore, I was going to renovate it – give it an entirely new look! It is a very sturdy piece and would look perfect in my guest room. 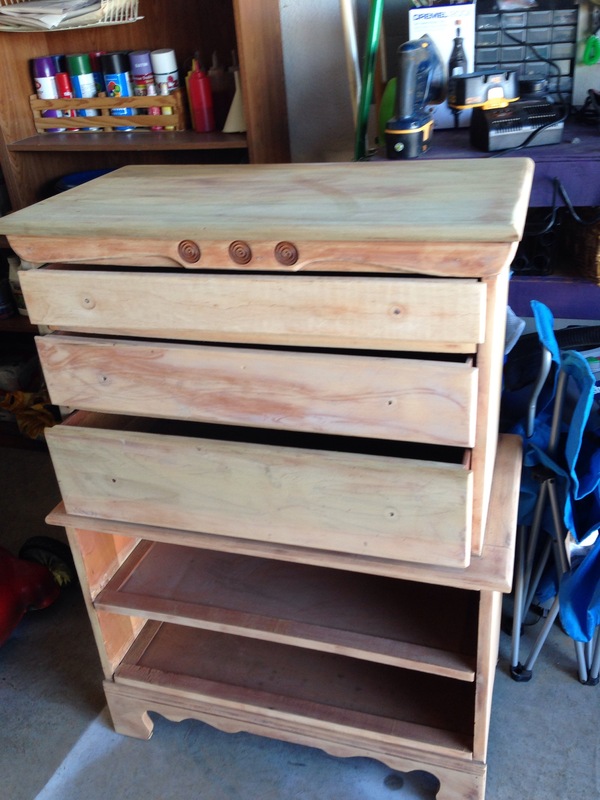 I sanded it down, conditioned the wood and send y’all pictures of the project. I told you about the oil stain on the top, and how that was the reason I wasn’t restoring the piece, I didn’t think the oil would take the stain. Chrisb74 suggested I just do a test of the spot… see if it would take the stain or not. I mean, it wouldn’t hurt to try, because I was very adamant that I was NOT restoring the piece! I couldn’t wait to funk it up with some fun colors and decorations. Except – the oil spot took the stain. Not only that, but the light blond piece of furniture, with all of the cute details started to come alive as I worked with it. Do you see the details, the variation on the wood, the movement? Y’all, I restored the piece. Mom and I went to a neighborhood that I was afraid to get out of the car, but had the most amazing restoration store! 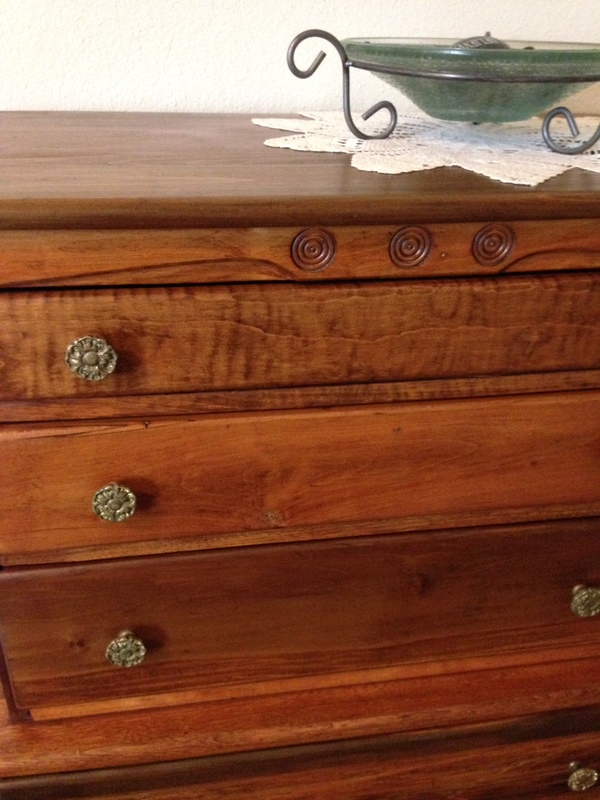 We found knobs that had the perfect feel for the piece. I put them on and let out a sigh. My favorite part though: the reason we had to go knob shopping was because I was missing one of the original knobs. And you’ll notice in this picture… I am still missing a knob! One of the knobs we bought, the screw was too short, so alas, I went full circle! 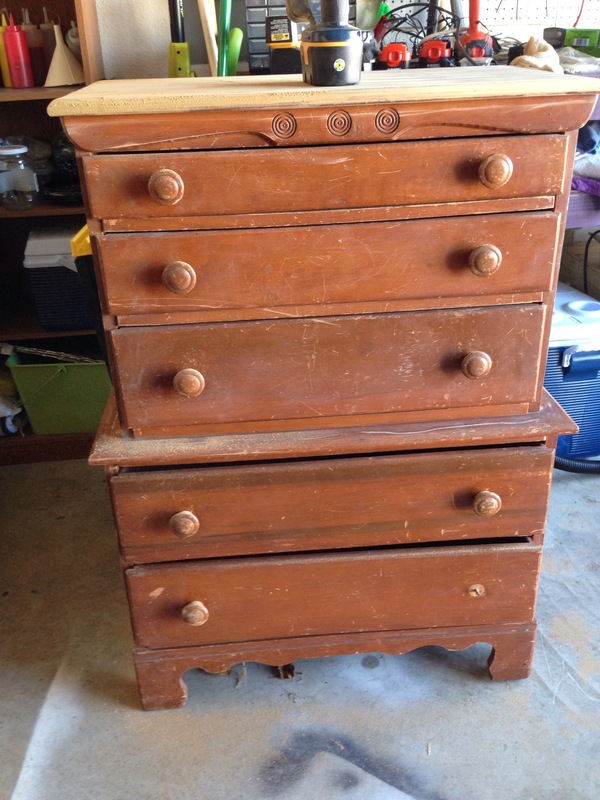 But, have no fear, I take that sucker with me everywhere, eventually I’ll find another screw that fits the antique knob and is long enough for the dresser! It looks perfect in my guest room, and it is so functional! I have it filled to the brim with linens! 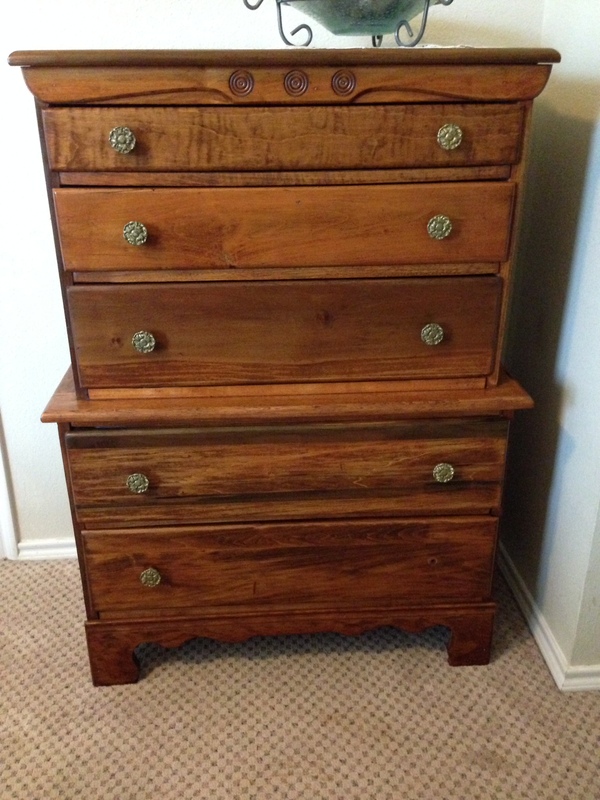 And, the antique pot belly dresser with mirror that I had in that space originally found a nice home with a couple, just starting out in their lives, and is now part of their little girls nursery! I think everyone in this story was a winner! So… what do you think? I’m just so happy with how it turned out, and really love that I was able to restore a piece that belonged to my great grandparents! Hi guys, it’s time for another handy dandy tutorial based on my life and being shared to enhance yours! 1. The day before your son leaves for a week in Florida, he should make sure you know that his shower head leaks and he flooded the bathroom. You get bonus points if this happens on the same weekend that you are replacing a fence with your neighbor on Friday, and then have a 12 hour fundraiser for his Cheer team on Saturday, with a 5:30 am flight on Sunday. 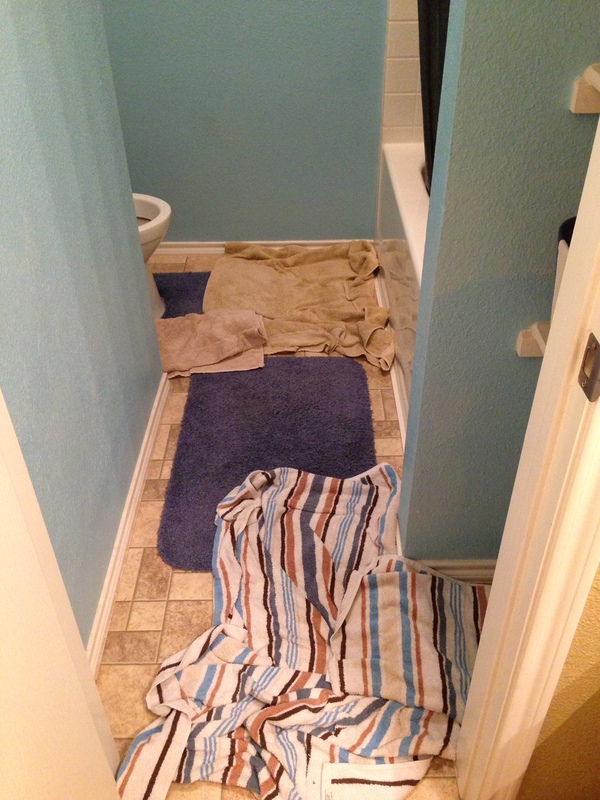 I think there should be additional bonus points if he uses Every Single Towel to clean it up. 2. Gather your supplies. 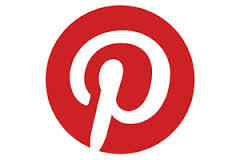 A quick trip to your favorite Big Box Store should hook you up! 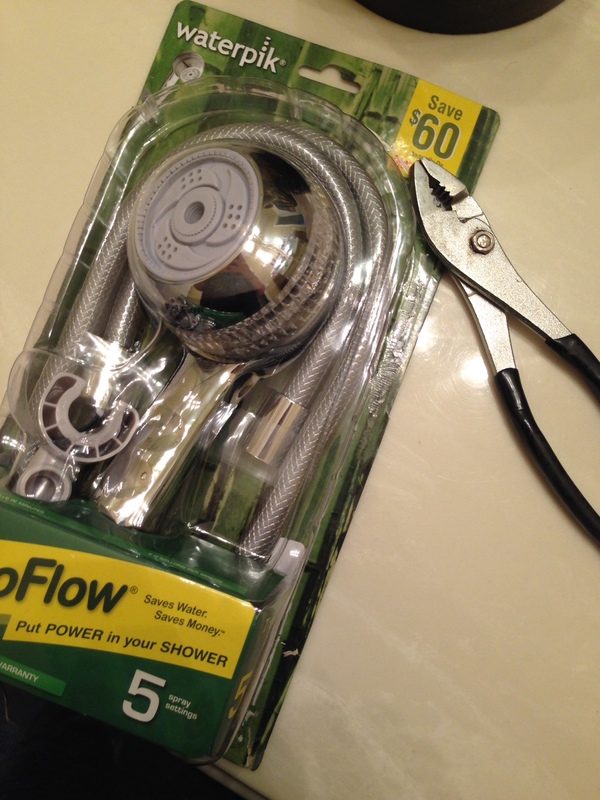 And fortunately, replacing a shower head is super simple! You can do this! 3. 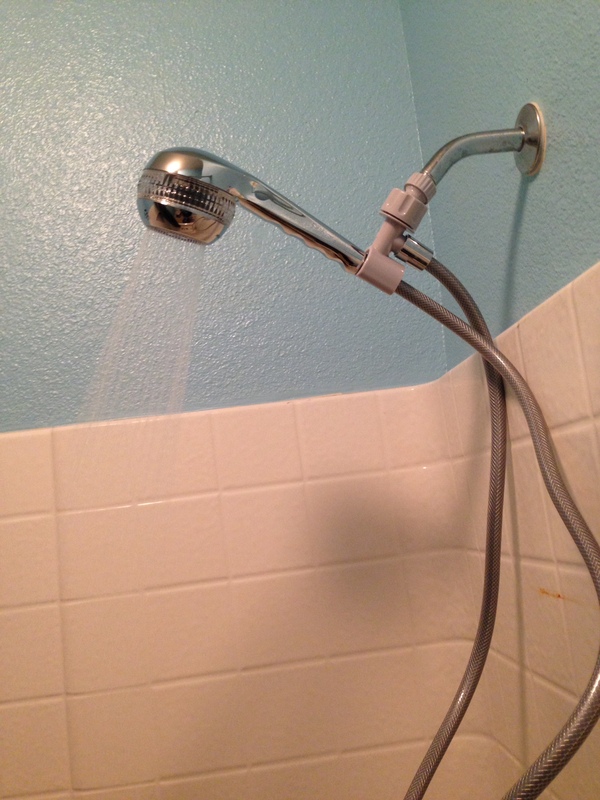 After removing the broken shower head, you should check the piping to make sure there isn’t anything stuck in the pipe or any obstructions. That. That is what they want me to stick my fingers in to make sure there aren’t any obstructions? No. Not Happening. That black hole of death is not eating my finger today. I took my chances and skipped this step. We’ll just pretend the instructions say “optional”. 4. Practice your mantra: Righty-tighty lefty-loosey. 5. No, your other right. 7. Cross your fingers. It’s okay to add in a prayer, too. 9. Declare success!! It worked! Ahem, I mean, of course it worked, it was so easy! 10. 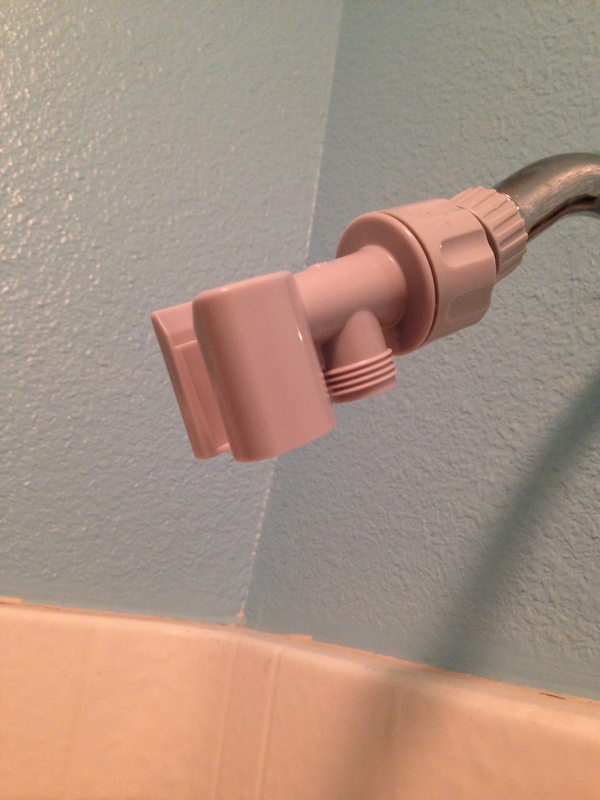 Send a picture to your son that you’ve replaced his broken shower head, cause, hello, you’re a Super Mom! 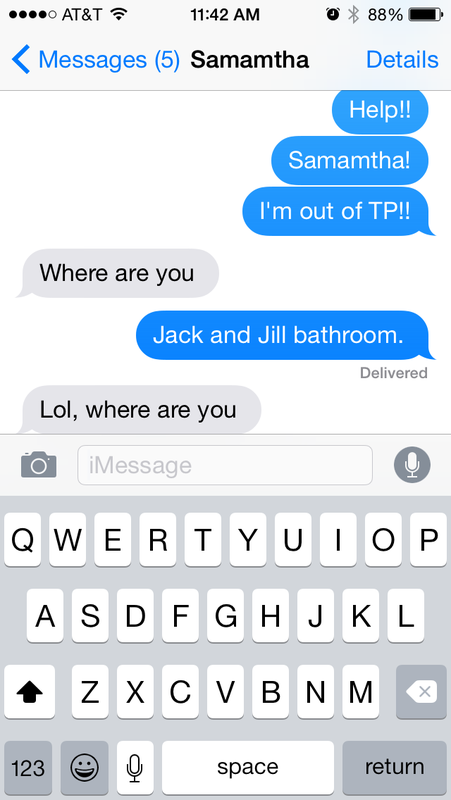 Determine that he’s never allowed to go on vacation without you again if he can’t at least answer a text!! Move on with your life anyway. 11. 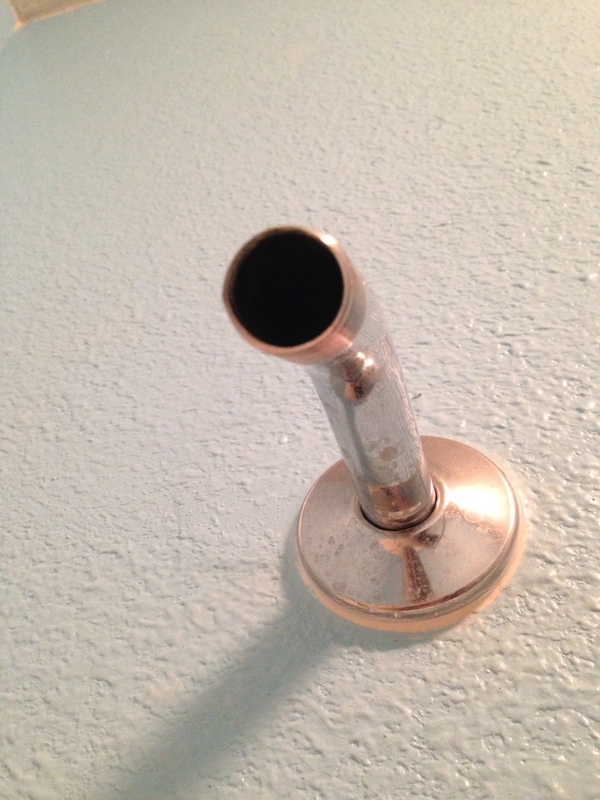 Hear a loud thump from the bathroom shower faucet. 12. Decide it’s totally okay to pretend you didn’t hear it! 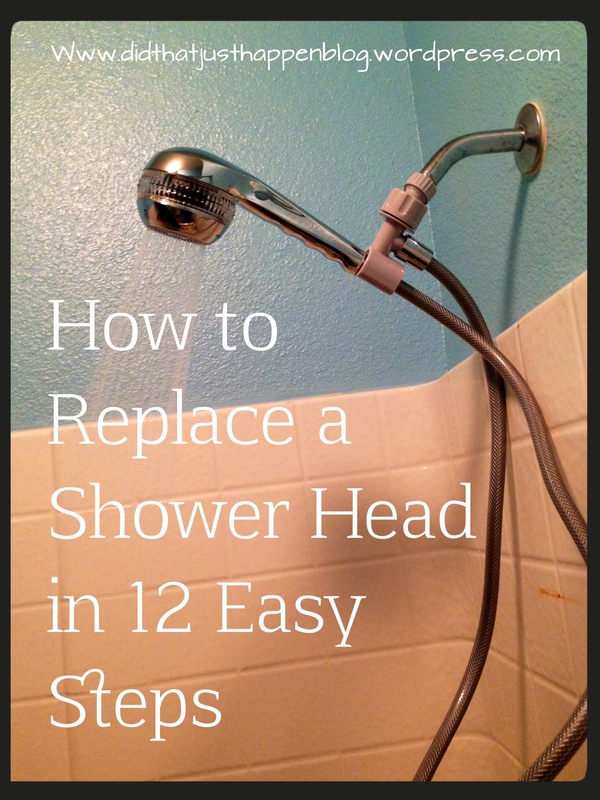 And that’s how you Replace a Shower Head in 12 Easy Steps, brought to you by Did That Just Happen Blog! This weekend was the Annnual 4th of July family reunion. I was so fortunate to grow up close to my extended family and so many of my childhood memories have my cousins in them; each year I make it a priority so I can spend time with my family. It’s my favorite way to celebrate! And there is quality bonding time with my niece! In other news, Mr. T was gone to FL for almost a week. His girlfriend is there for the summer visiting her father and she invited him to spend some time and meet that side of the family. 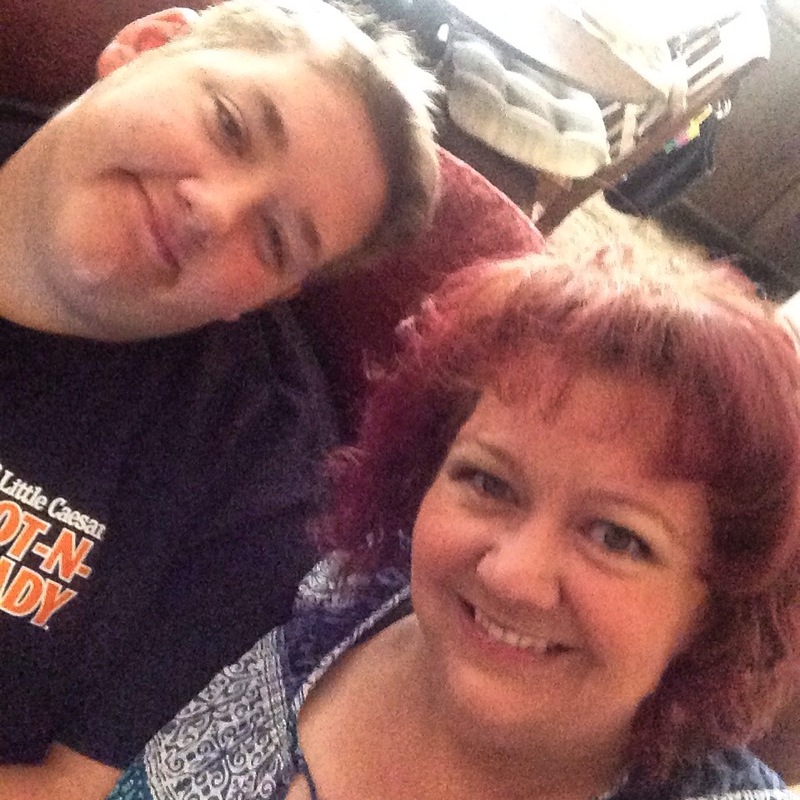 The step-mom was so very gracious and generous with sharing pics and tagging me on Instagram, and he had a great time! But I’m super happy he’s back, too! I needed a treat the other night… and I don’t keep treats on hand, because treats on hand last about as long as it takes to type this sentence and then they are gone! As such, I’m always on the lookout for some yummy treats that are fast and easy to make, and ones that don’t make 3 dozen at a time! Because see above! 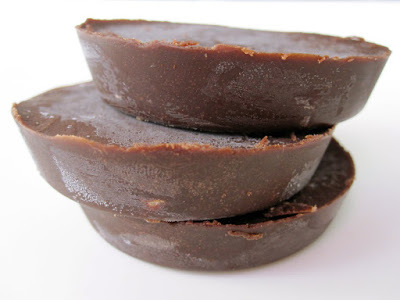 I found Primal Fudge by Practical Paleo on Pinterest and had to prepare it. Okay, I’m done with the alliteration. I just couldn’t resist once I got started! How cute are those little guys? 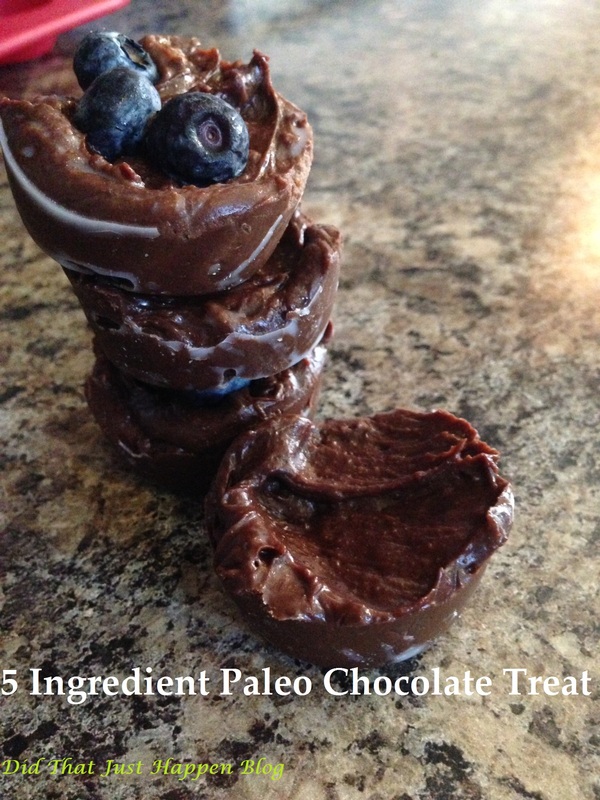 And while I am always looking for an excuse to use my muffin tins – she had me at 5 ingredients! 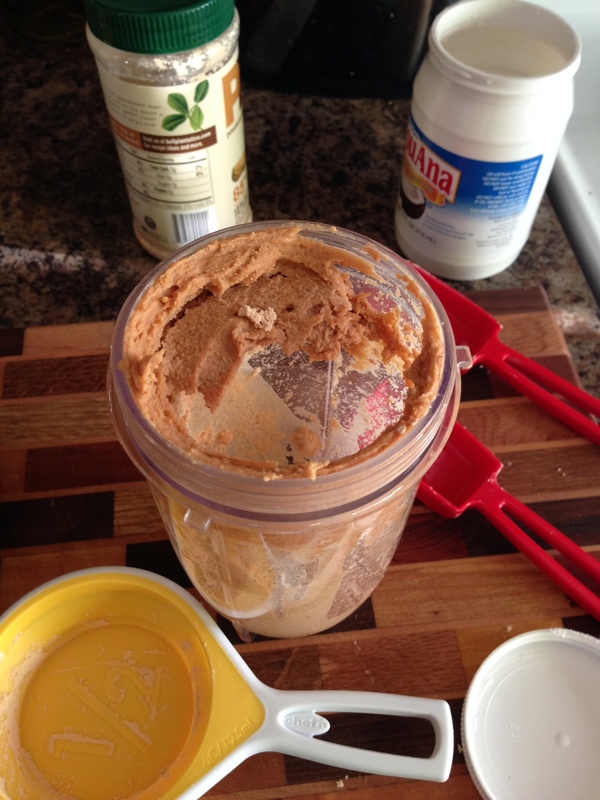 I’m currently obsessed with my PB2, and almond butter, peanut butter, same diff. I’ll just mix up half a cup of my PB2 and it’s half the calories! 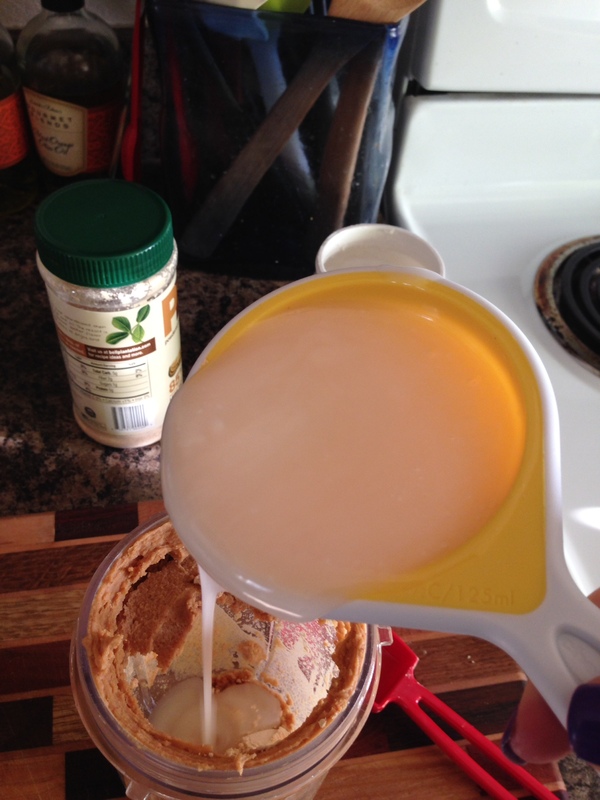 I ended up mixing 1/2 cup dry and that shrunk as I was re-hydrating it, so I added in another 2 tablespoons. This may or may not be important later on! 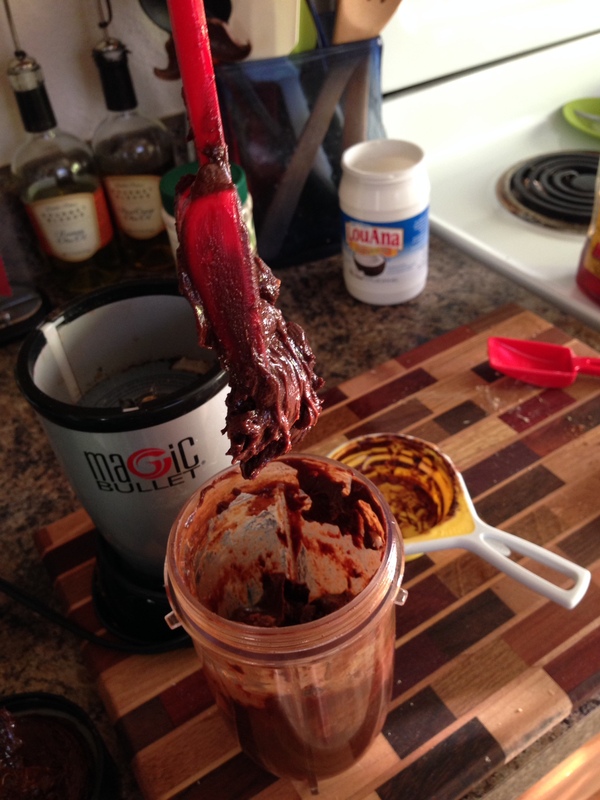 Once the peanut butter was mixed up, it was time to add the melted coconut oil. Like how I did the whole Pioneer Woman snap-a-picture-while-you-are-pouring thing? I was proud of myself! 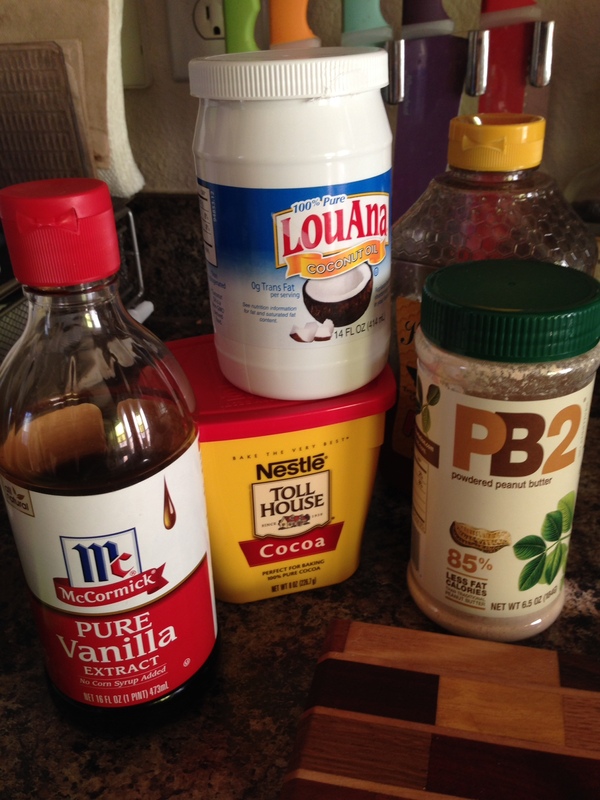 Then I added in the rest of the ingredients and got to mixing. It looks odd… but it’s starting to incorporate. 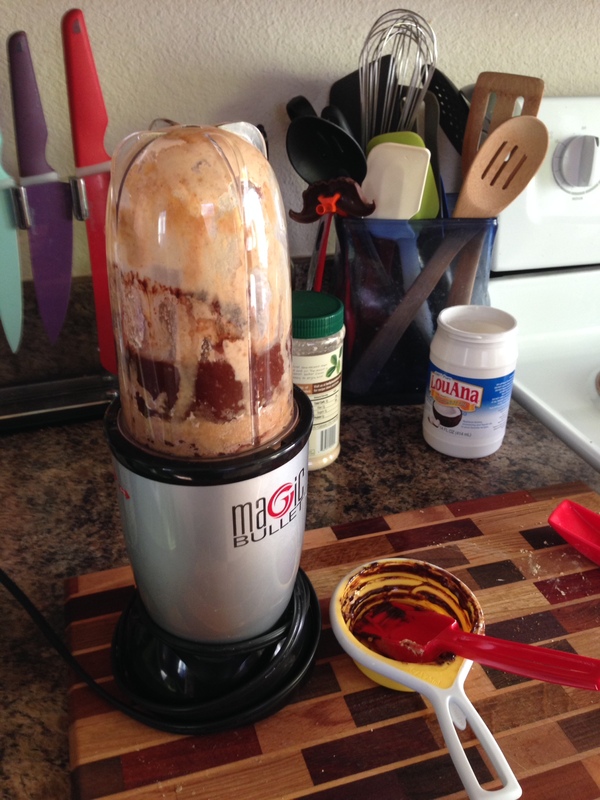 Oh, and the original blogger did mention that you could use either a blender or food processor. I’m starting to wonder about now if my food processor would have been the better option. 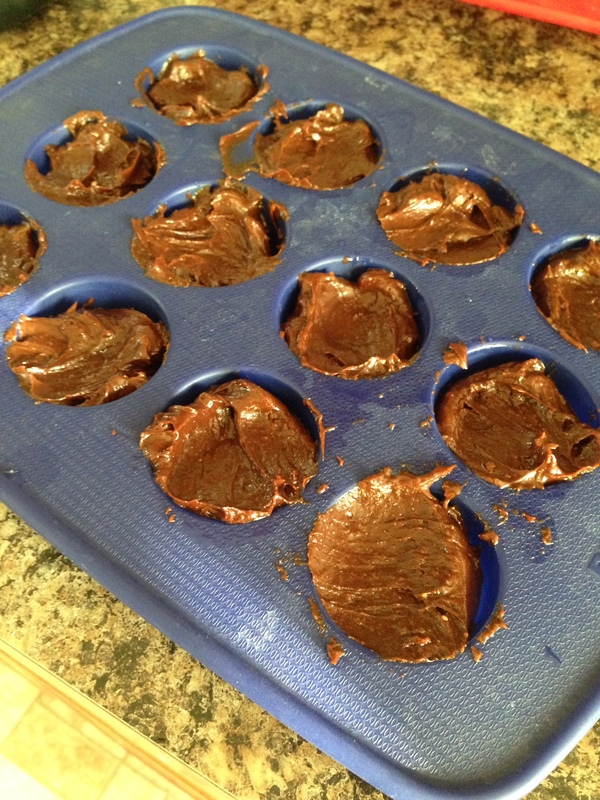 Once everything is mixed, you are supposed to “pour” it into the muffin tins. POUR. Does that look like it will pour? So, let’s improvise and add in a touch more honey and a splash of vanilla to moisten it up and make it pour-able. 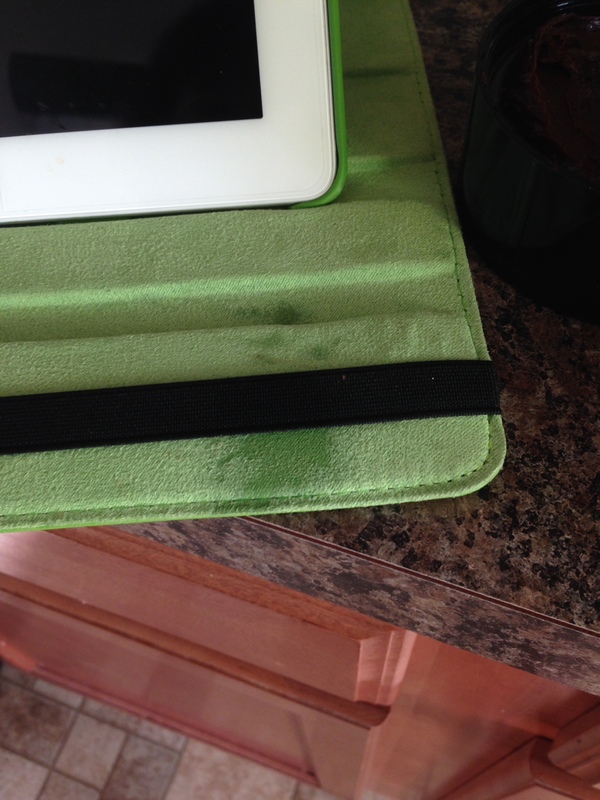 Then, just for fun, splash some vanilla on your tablet cover. At least it’ll smell good for a bit. Sadly, even after adding more liquids, the mixture wasn’t able to be poured. And I grabbed a handful and popped the frozen blueberries on half of my chocolates. And then reset my timer. Mine look nothing like the original! They are pretty darn ugly, and you can see those white lines – where some coconut oil didn’t fully incorporate – so it’s a #PinterestFail, but you know what? They are pretty darn yummy! And at about 70 calories each, heck yeah I’m eating them!